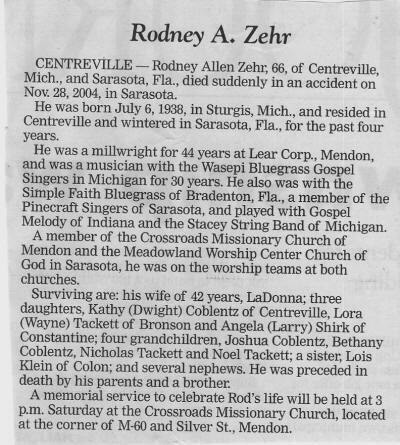 Rod will be missed by a whole lot of folks, by his wife, LaDonna, his kids, his grand kids, friends and relatives, and by the Wasepi Bluegrass Gospel Singers. He was in the group from the start in 1974. He loved to get on that old bus, travel to our destination, set up the equipment, in the hot or the cold, just so he could have a shot at telling others how much he loved the Lord. Somehow, I had a feeling that he could never find just that right words to describe how much he appreciated what the Lord had done for him and how much he loved the Lord. 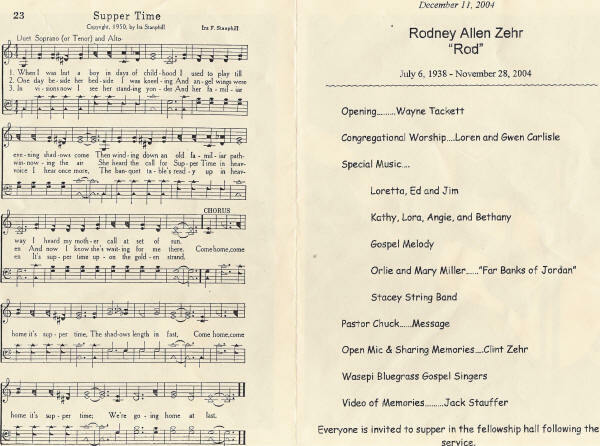 He loved to sing and shout hallelujah, shout AMEN when one was needed, and say a word for the Lord, even in situations when it seemed unpopular. Many, many times Rod spoke of how we are just living here temporarily and that his desire was to get to his Heavenly home. Well, he's made it in fine fashion. Rod was a great song writer. His songs spoke of worship and admiration to the Lord, and of what the Lord had done for him. 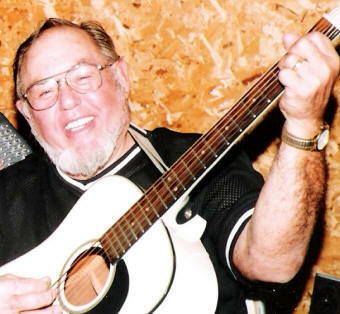 Many of the songs he recorded were ones that he had written. Many of his songs were never recorded. Someday I'd like to hear him sing those songs when we reach that other shore. Here are some photos and memories.